Exciting News! Sew Fresh Fabrics is Here! One of the reasons that I have been a negligent blog poster these days is that I’ve been working very hard with my good friend Becca (you may know be13cca on Flickr) on our new Etsy fabric shop, Sew Fresh Fabrics! We are both hopelessly fabric addicted, quilting maniacs and dream of colorful bolts of goodness. What better way to live the dream than open a fabric store, right? I took a workshop this past weekend with Christine Fries-Ureel. 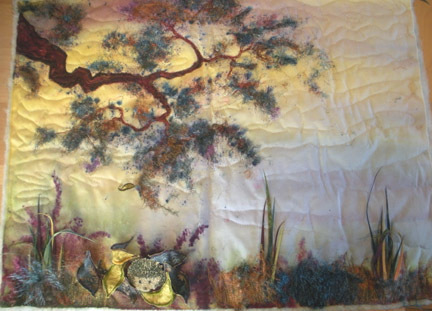 She’s an amazing art quilter and teacher. Her forté is thread painting and embellishment. I learned a ton about the techniques and materials to create all sorts of dimension and shapes in fabric and thread. 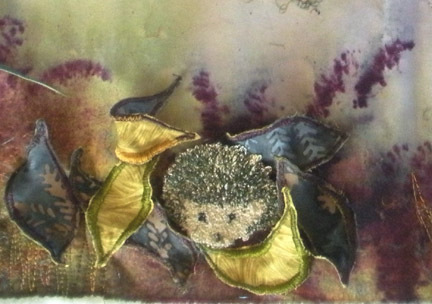 I started with one of her painted quilt tops and did the embellish stitching and created the cutest little hedgehog and leaves for him to live in. (See his little face down there?) It was tons of fun. Don’t miss a chance to see her work or take a class with her. Her story and journey to and through the quilting world is inspiring. I’ve finally finished my Round 1 quilts in the Old Red Barn Quilt Along. The Quilt Along is on Round 4 now and I may jump back in to join them (though I may wait until after the holidays). These pictures are just one of the lap sized quilts I made. I cut first and read directions later. I didn’t realize it would make a bed-sized quilt. I had no desire to quilt another bed-sized quilt nor did I need one in the fabulous fabrics I picked. (I live with boys, you see. I’m still under orders to make a wild animal quilt. The Amy Schimler chickens and Heather Ross fish weren’t going to cut it for the boy in question, however they did help me name the quilt “Surf and Turf”.) So I made two lap sized quilts. The second one is for sale in the gallery where I work. I love the fabrics. I picked every one of the top fabrics from my stash. It just goes to show that you can never have too much fabric. If you love it, you’ll find the perfect quilt for it!